South Tampa Pilates provides one of the most sought-after friendly atmospheres with professional instructors to help clients meet their personal fitness goals. Our staff has earned certifications in a range of respected Pilates methodologies allowing for the greatest variety of workouts. Classes range in experience level from educating beginners, engaging intermediates and challenging advanced devotees. You can choose from private, semi- private and class environments on any given day of the week. 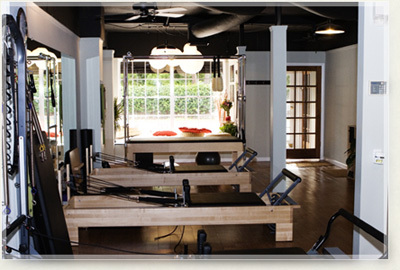 South Tampa Pilates prides itself on classic mat instruction, Reformer, Chair, and Cadillac training in a personalized, client-oriented envioronment not offered anywhere else in South Tampa. Developed by Joseph Hubertus Pilates in the early 20th century, Pilates encompasses over 500 different exercises that simultaneously engage one’s core while stretching, strengthening and lengthening the muscles. Our studio incorporates both the traditional and modern approaches of this widely praised workout to build you a more balanced body. We look forward to welcoming you within our space! Add a twist to your regular regime. Check the schedule and get ready to be amazed at the advancement of Pilates.